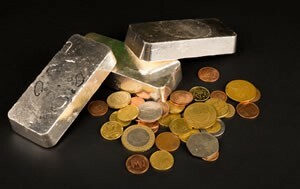 Precious metals ended lower in their start to the new trading week on Monday as the U.S. dollar logged gains. Gold for December delivery shed $2.80, or 0.2%, to settle at $1,343.40 an ounce on the Comex division of the New York Mercantile Exchange. The settlement is the lowest since Aug. 8. "The firm U.S. dollar, rising bond yields and significantly higher rate hike expectations in the U.S. are apparently weighing on prices," Commerzbank said in a note as reported by Reuters. "According to the Fed Fund Futures, the probability of a U.S. Federal Reserve rate hike this year is now at over 60 percent again." Gold futures traded from a low of $1,335.40 to a high of $1,345.70. They edged up 0.2% last week, their first weekly gain in three weeks. Elsewhere, silver for September delivery dived 45.80 cents, or 2.4%, to settle at $18.859 an ounce. Silver futures ranged from $18.71 to $19.25. They lost 2% last week, giving back gains after Friday’s decline of 2.1%. October platinum moved down $10.20, or 0.9%, to $1,108.20 an ounce, trading between $1,101.60 and $1,119.50. Palladium for September delivery dropped $17.20, or 2.4%, to $692.15 an ounce, ranging from $690.65 to $711.45. Last week, platinum fell 1% while palladium surged 2.7%. Gold fell $10.50, or 0.8%, to $1,335.90 an ounce. Silver fell 50.5 cents, or 2.6%, to $18.91 an ounce. Last week in London bullion prices, the decliners included gold by 0.4%; silver by 2.3%; and platinum by 3.5%. Palladium, meanwhile, posted a 2.4% weekly increase. U.S. Mint bullion products logged increases of 3,000 ounces in American Gold Eagles adn 185,000 ounces in American Silver Eagles.